Croeso & welcome to a lovely apartment in the 'Queen of Welsh resorts' Llandudno. The apartment is conveniently located in a residential building within a 5 minute walk of the promenade & Victorian pier. This 2 bedroomed apartment sleeps 4, there's a comfortable double bed in the master bedroom with an en-suite shower room, the second bedroom is set up to sleep 2 in bunk beds, a main bathroom, plus an open plan lounge with sofa bed (available for a 5th guest, an additional charge applies), you'll have use of Sky Q television, DVD/TV (selection of dvd's available), WiFi and a modern, well-equipped kitchen. The kitchen has a hob, oven, microwave, washing machine, tumble dryer & ironing facilities. Central heating included in the booking rate. Control will be shown to guests on arrival. Guests may use the washing machine but washing powder is not provided. Guests may use the tumble dryer and are responsible for the emptying of the water condensing drawer. 1 Bath towel & 1 hand towel per person Not to be taken to the beach. Comfortable living area has 2 armchairs & footstools and a 3 seater sofa bed. 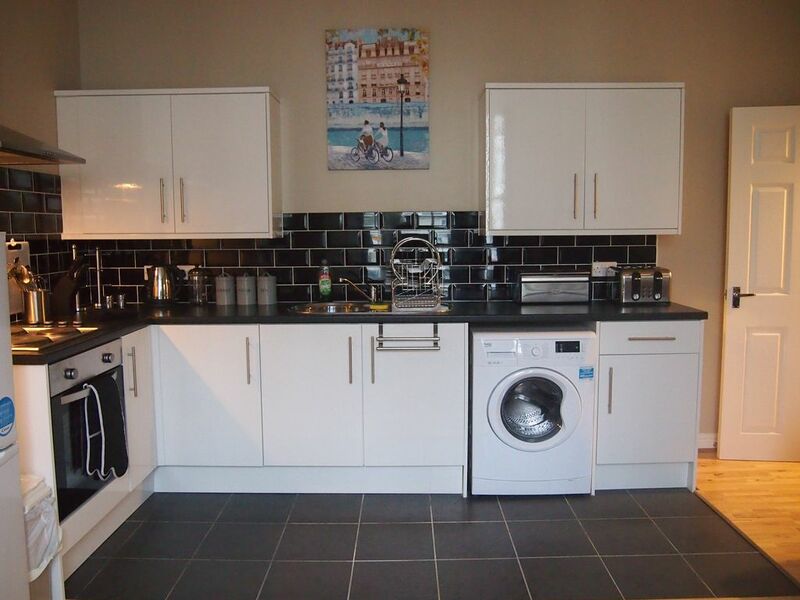 Fully equipped kitchen with microwave, kettle, toaster, oven, hob, fridge/freezer. Ellen was the perfect host. Excellent communication throughout And a lovely warm welcome. The flat had everything we needed, including washing machine, dryer and hairdryer. Parking wasn't a problem and although we were right in town there was no noise (this was New Years eve). We were a family of 5 and had plenty of room for us for the 4 days we were there. Hope to return again in the future! Cosy, clean and near amenities. Fast check in. Ellen was there to greet us and explained everything. The apartment had everything that we needed except dishwasher. But it was fine with us. We were worried about parking initially considering it was peak season, but there were always free spots on nearby streets with no parking limit. This is a Great apartment and so close to the town, pubs, cafe's, pier, promenade and everything else you might need. The parking is a nightmare. As soon as one car left another took it's place straight away, we ended up parking up the road somewhere. Don't let that put you off though, This is a lovely clean apartment with all things you need, washer, dryer, tea, coffee, bottle of milk in fridge (Thanks),Towels etc. Also sky tv with Netflix, which was a bonus. A two minute walking distance to the lovely town of LLandudno and the Pier, where there is everything you need. You must also have a trip up The Great Orme as it is such a wonderful sight from the top, Walk or go up by cable car or tram. Have already booked up for next year. The flat was good and met our needs. We managed to see all that we had planned, but trying to get parked when we came back after our days out trying to find a parking spot was a nightmare. We're glad you enjoyed your stay at the apartment and sorry you struggled to get parked up some days, I guess with Llandudno being such a popular resort to visit this can be an issue in the summer.